Green Lanes vs Hammersmith – a forgone conclusion? There’s more to Turkish food than just kebabs, but by gum are they tasty. 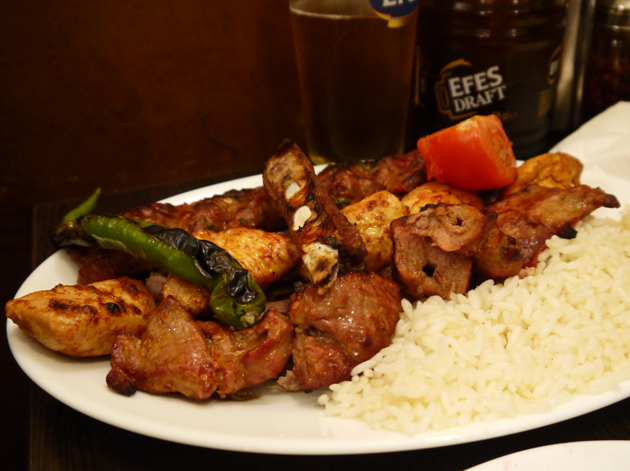 One of the best London neighbourhoods to visit for Turkish kebabs is Green Lanes, but trekking out to this north London thoroughfare isn’t always convenient – especially if you live further south. 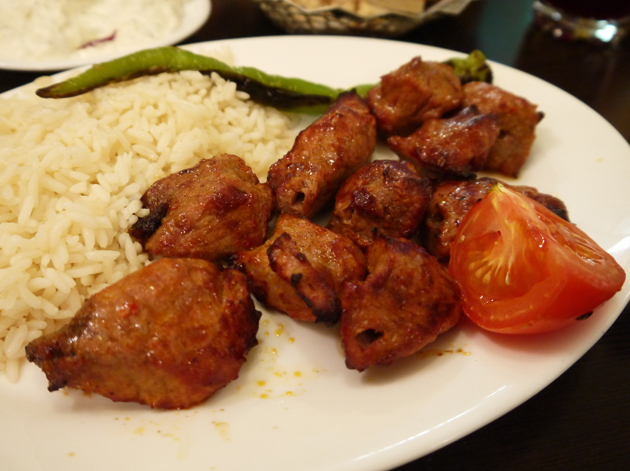 I therefore decided to revisit Yayla, one of my favourite Green Lanes kebab restaurants, as well as Ottoman, a Turkish eatery in Hammersmith highly recommended by Kangaroo Face, to see how they fared against each other. I revisited Yayla on a weekday evening with the help of Veal Smasher, Happy Buddha and Templeton Peck. 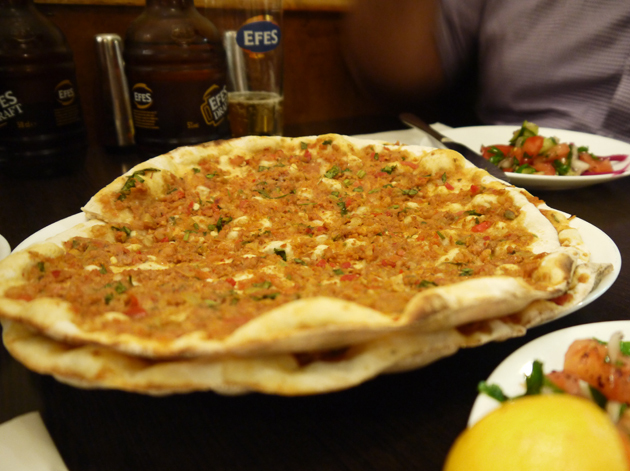 We started out by sharing a couple of lahmacun, a sort of Turkish pizza. 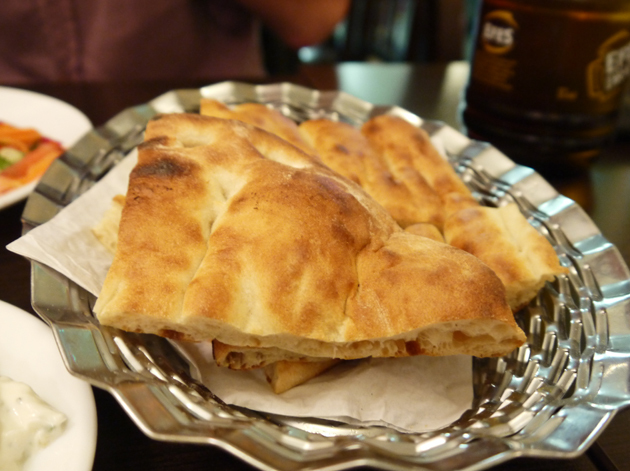 The crispy thin dough base is topped with moist minced lamb as well as diced tomatoes, peppers and parsley. Simple, but moreish and satisfying. I actually prefer these to Neapolitan pizzas in a way. 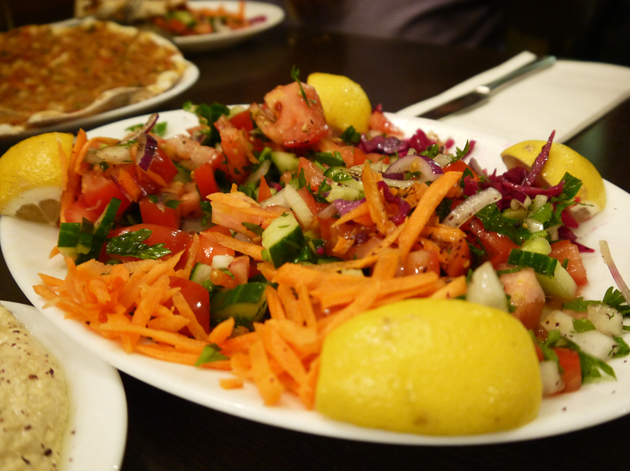 Part of what makes Yayla such good value is the mountain of fresh salad and warm Turkish bread provided for the table. Although Veal Smasher hilariously refused to touch the salad, the refreshing combination of beetroot, carrot, tomato, cucumber, parsley and lemon juice is an essential counterpoint to the chargrilled kebabs. The warm, soft bread is a winner too. Salad. It’s like Kryptonite to the Veal Smasher. 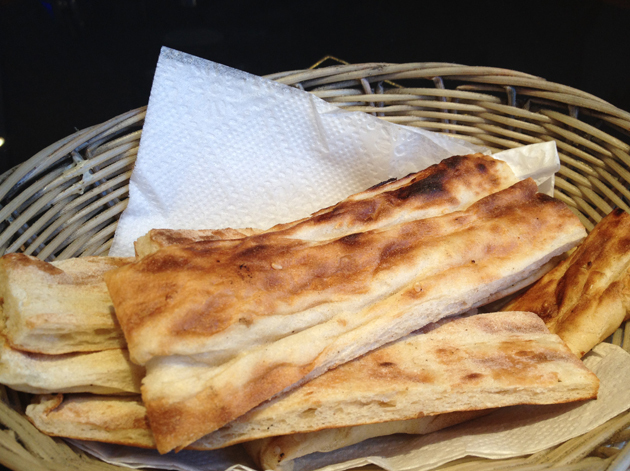 Pide bread. It’s like a pitta, but better. Templeton Peck chose what I think is actually one of Yayla’s weaker dishes. 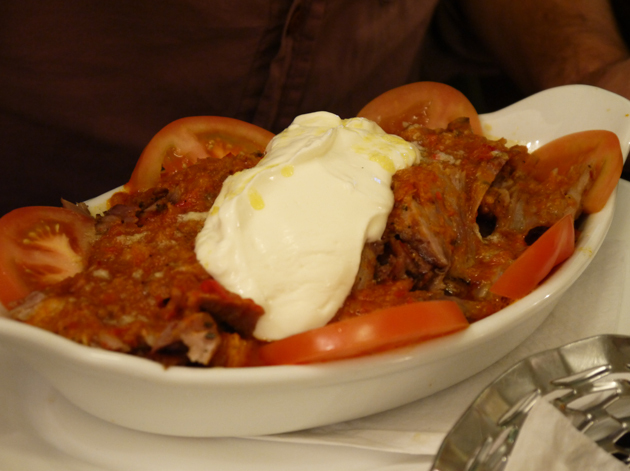 The Iskender kebab consists of lamb doner meat served on top of warm bread in a tomato sauce and then topped with yoghurt. Although the doner meat is moist without being too greasy or covered in fat, both the tomato sauce and the yoghurt taste a little flat. Perhaps some melted sheep butter would help. I opted for the lamb shish. While the thick chunks of meat were moist and lightly smoky, their usual charred offaly flavour was more muted this time around – almost to the point of being absent. Shish! I’m trying to eat here. Happy Buddha also noticed this while tucking into his mixed grill – a large plate groaning under the weight of ribs, lamb kofte and both chicken and lamb shish and doner. Veal Smasher had also opted for the mixed grill and he was much more vocal in his approval of the moist, chargrilled chunks of meat, especially the lightly spiced chicken shish and the smoky, lightly fatty kofte. I wetted my whistle with a bottle of salgam. This spiced and salted drink of pickled carrots and turnips served cold won’t be to everyone’s liking but I’m a big fan of its tingly, tart yet refreshing taste. Veal Smasher, Happy Buddha and Templeton Peck all went for the Efes Draft. Peck thinks it’s smoother and crisper than the standard brew Efes. If nothing else it comes in a funny bottle. 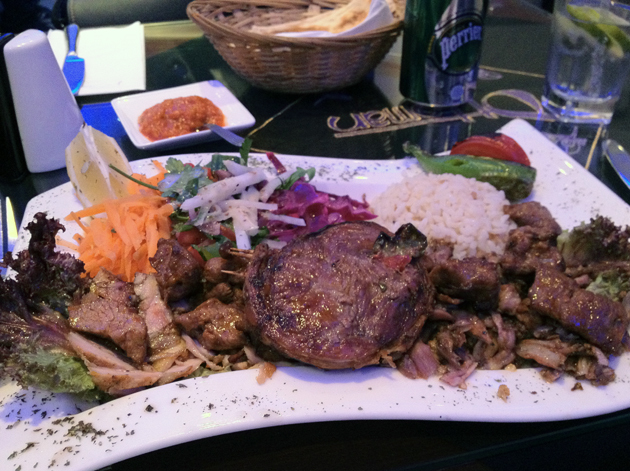 Located a good 15 minute walk south of Hammersmith tube station in a mainly residential area, it’s no surprise that most of the clientele at Ottoman are locals. Whereas Yayla has all the aesthetic charm of a canteen decorated by someone’s grandmother, Ottoman is slightly glossier and is bathed in a purple light vaguely reminiscent of a cheap provincial nightclub. A sliding door separates the take away counter from the 24 cover seating area. My first visit to Ottoman was less than auspicious, although my timing in the wee hours of a Saturday evening may not have helped. My puréed aubergine salad should be served cold, but not refrigerated to the point of cryopreservation as was the case here. Even worse, it tasted more of tomato and garlic than of aubergine. Salads should be served cold, not chilly. The mixed grill was, well, mixed. The lamb cutlet was too tough, the chunks of the lamb shish were on the small side and both the lamb and chicken doner was too greasy for my liking. 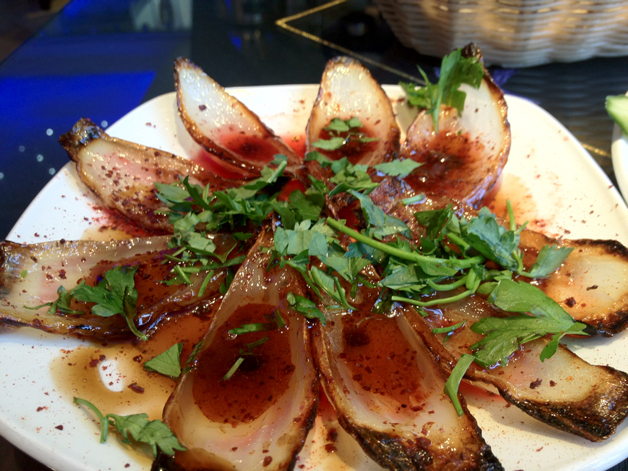 All the meat also lacked the lightly charred, smoky hints that helps make their counterparts at Yayla especially tasty. Given Kangaroo Face’s enthusiastic recommendation for the place, I thought it only fair to give Ottoman a second chance. 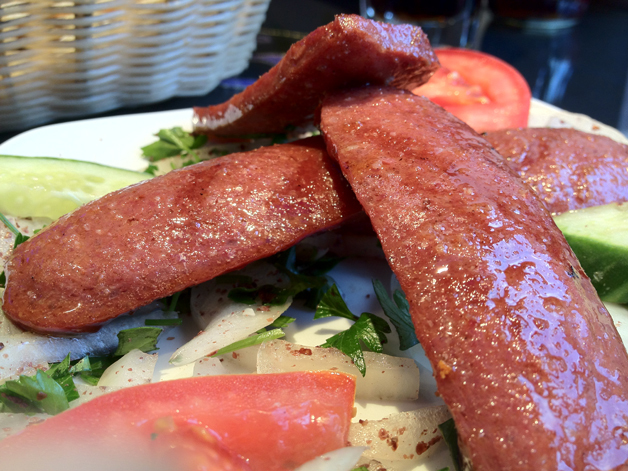 This time around I started off with the sucuc, a smooth and mildly garlicky Turkish sausage. Its garlicky flavour was complimented well by sprigs of parsley, shavings of beetroot and a dash of lemon juice while the charred sweetness of the grilled onions went unsurprisingly well with the fattiness of the sausage. It’s like a less annoying version of Pepperami. If that helps you. Grilled onion accompaniment to the sucuc, served on a separate plate. Ottoman’s lamb kofte wasn’t quite as successful. Although moist and meaty, it was a little too greasy which suggests that the meat-fat ratio had been tilted a little too much in favour of the fat. 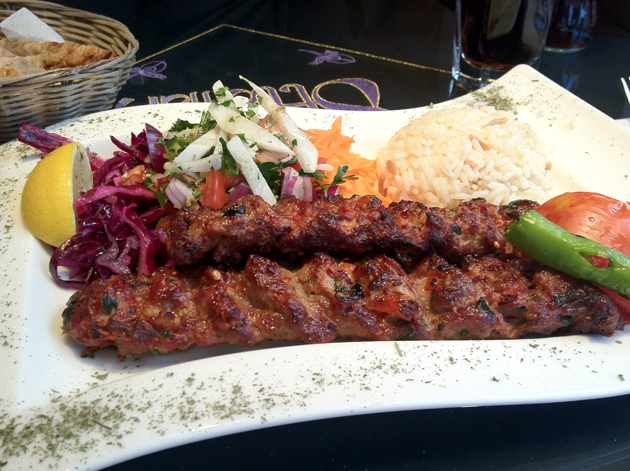 It also lacked the charred smokiness and offaly taste that characterises the best kebabs. Although the salad is nothing to write home about, the soft, floury bread went down very nicely. It’s no contest. 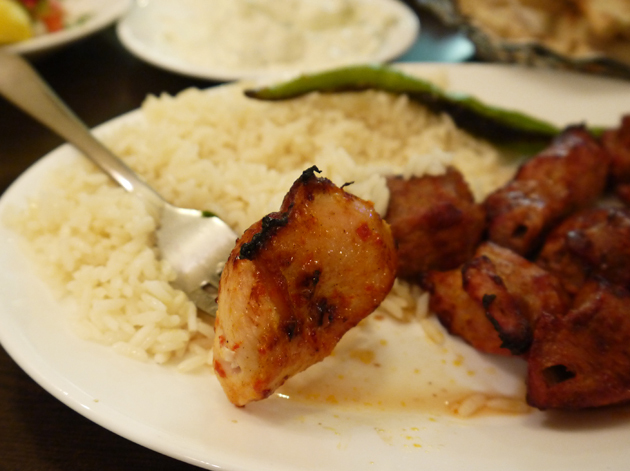 Although Yayla isn’t quite as consistently excellent as it used to be, it is still very good. Ottoman isn’t bad, but it’s clearly coasting along on the loyalty of its local clientele. There’s nothing wrong with that, but it could be so much more. 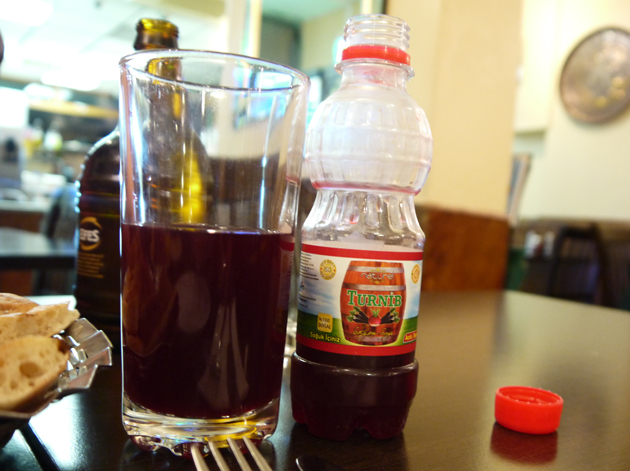 Total cost for one person including soft drink: £13-15 approx. Total cost for one person including drinks: £16 approx. 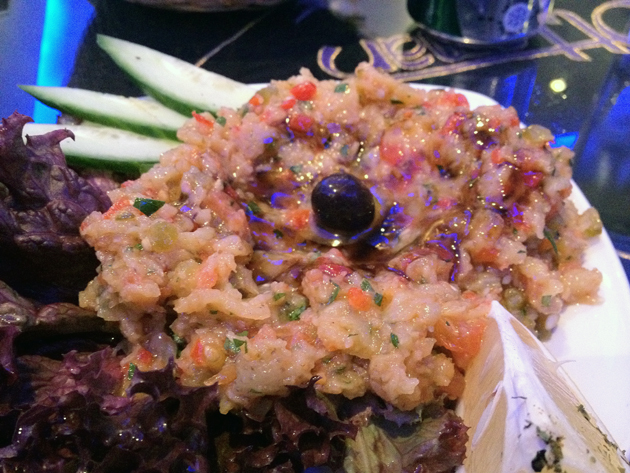 Tags: kebab, london, ottoman, restaurant, review, yayla. Bookmark the permalink.